When composers Tim Rice and Andrew Lloyd Webber brought their controversial musical sing-through to the Broadway stage in 1971, four-and-a-half decades ago, it wasn’t heralded by critics. In fact, the mixed reviews didn’t bode well for the young men who at the time had only one successful musical to their credit, Joseph and the Amazing Technicolor Dreamcoat. 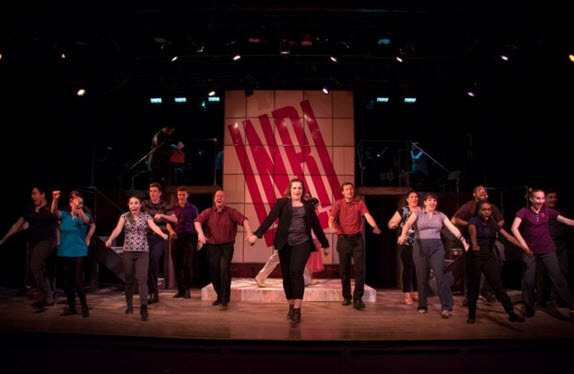 But after thousands of national and international productions, a film and a recent NBC TV staging starring John Legend, Sara Bareilles, Brandon Victor Dixon and Alice Cooper, this musical hasn’t missed a beat or an audience. 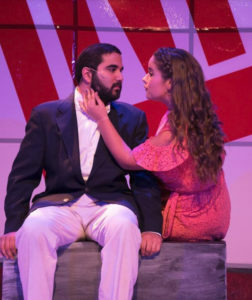 Rishabh Bajekal (Jesus of Nazareth) and Thea Simpson (Mary Magdalene) in Jesus Christ Superstar, now playing at the Little Theatre of Alexandria. Photo by Matt Liptak. You know the story. A gentle, charismatic carpenter from Nazareth with a devoted following is betrayed, abandoned, tormented and ultimately crucified by King Herod’s army. His only faithful supporter remaining is a former prostitute, Mary Magdalene, played by Thea Simpson. Director Jim Howard interprets the setting as INRI Inc., a subsidiary of Genesis, Ltd., a corporate headquarters where cell phones, laptops and iPads are the preferred mode of communication for text updates on Jesus’s status, and where millennials celebrate with fist bumps and high fives. Notwithstanding some mic glitches in Act One on opening night (“blessedly” corrected by Act Two), we could easily hear the powerful and chilling voice of Rishabh Bajekal as Jesus of Nazareth. 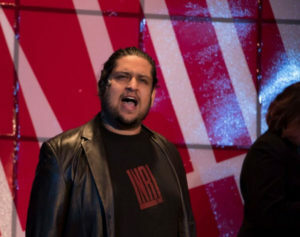 Bajekal, had at first been cast as Judas when Howard asked him if he would like to play Jesus. That left Howard to find his Judas, which he did when he discovered Carlos Antonio Ramirez, a local radio traffic reporter and sometime local band member who has an emotional, raspy, rock-and-roll voice that reaches far beyond the theater’s front door. His star turn commences in the second number with “Heaven on Their Minds”, and from that moment on every time he solos, he rattles the theater’s foundations. Sweet Jesus, this boy can rock out! Another pitch perfect belter is Cody Boehm who plays Simon Zealotes. In the eponymous song from the middle of Act One, she sets a thunder-and-lightning tone that only Bajekal and Ramirez, and the fathoms-deep bass voice of Ryaan Farhadi as the evil Caiaphas can meet. And Andy Izquierdo, coming off his success as Elwood P. Dowd in LTA’s recent production of Harvey, stuns in his role as the campy/snarky King Herod with a hilarious second act surprise in the number, “King Herod’s Song”. 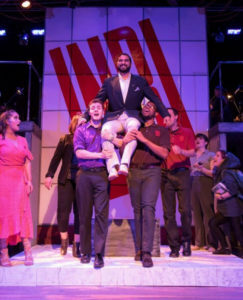 Cody Boehm (Simon Zealotes) in the center with the ensemble in Jesus Christ Superstar, now performing at the Little Theatre of Alexandria. Photo by Matt Liptak. The excellent 24-member cast is choreographed by Michael Page, veteran of five previous productions at LTA of which this one has the most dance numbers. How, you may ask, can so many performers dance and sing on a relatively small community theater stage? Very well! Music Director Christopher A. Tomasino, a six-time WATCH Award winner, all for six LTA musicals, conducts this jammin’ 21-piece band (including ten horns!). Kudos to guitar soloists Ben Young and Danny Santiago who are outstanding. Highly recommended, even if you’ve seen it a dozen times or more. Additional cast members – Michael Gale as Peter, Amy Lapthorne as Annas, Emmy Kampe as Priest, Hans Dettmar as Pontius Pilate and a fifteen-member ensemble. Lighting by Ken and Patti Crowley, Assistant Choreographer Liz Colandene and Set Design by Matt Liptak. Through August 11th at The Little Theatre of Alexandria, 600 Wolfe Street. For tickets and information call the box office at 703 683-0496 or visit www.thelittletheatre.com.